In the '90s, I had a compilation of shareware and shovel ware games called 40 Best Windows 95 Games from SoftKey. 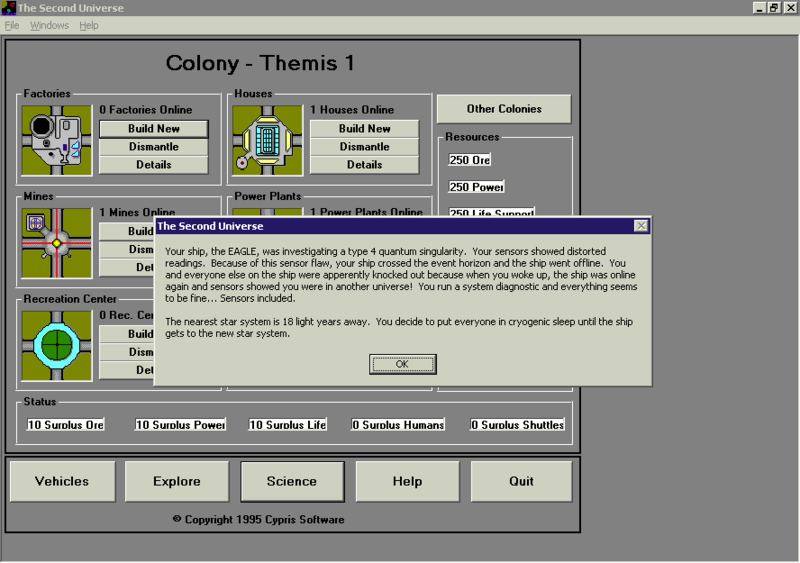 One of the games was "The Second Universe." Does this look like (conceptually) a clone of Outpost (1994, Sierra On-Line) crossed with Alien Legacy (also 1994, Sierra On-Line), or what? It doesn't really play much like Outpost does; I think. It plays more like a simplified "time/turn-based" equivalent of Master of Orion (Time can be accelerated), if I recall properly. 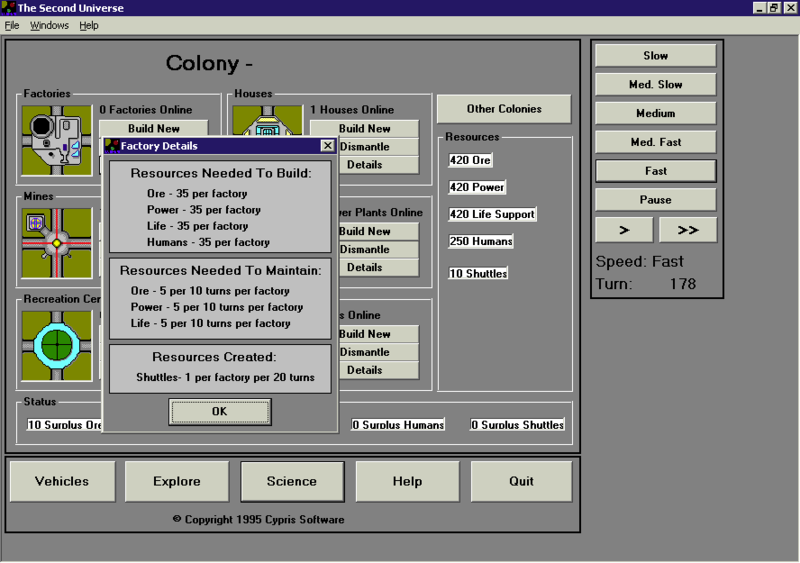 You control multiple colonies, deal with certain events (depends on the choices you make which determines which events you encounter) and send resources from one colony to the other, with I believe the end goal of surviving some calamity. This looks interesting. So does Alien Legacy -- I may have to check them out some time. I personally liked V3 of Gravity Well for the 95/98; it had all the various weapons in the game and defenses in the game, but it was quite a bit simpler. You could play the demo and basically by playing that you'd never really need to buy it. V4 added a lot of improvements and took away a lot of the viable strategies in V3 and hid most of the advanced tech behind a paywall. V5 added a few new things to V4 that were welcome, but again locked behind paywall. Unfortunately that paywall was always exclusive to pay via cheque or cash sent in the mail. They didn't use any other form of distribution, and they unfortunately don't sell those games anymore; I tried asking back in 2013, but they replied about 1.5 years later and said they don't sell it anymore. They have a "new" V6 that plays nothing like the originals with a weird monetization scheme to it, that I doubt I'll ever try. There are cracked versions available. Just saying. I tried finding cracked versions of them over the years back when I played the demos diligently. None of the cracked ones worked; they either made the "register me" box go away but not register it, or the game refuses to launch period. So, unless you have some working cracked ones I don't know about, then could you tell me where to find them? I just did a quick google search and came up with a lot of listings. I didn't examine anything, just noted that there were a lot of hits when searching.